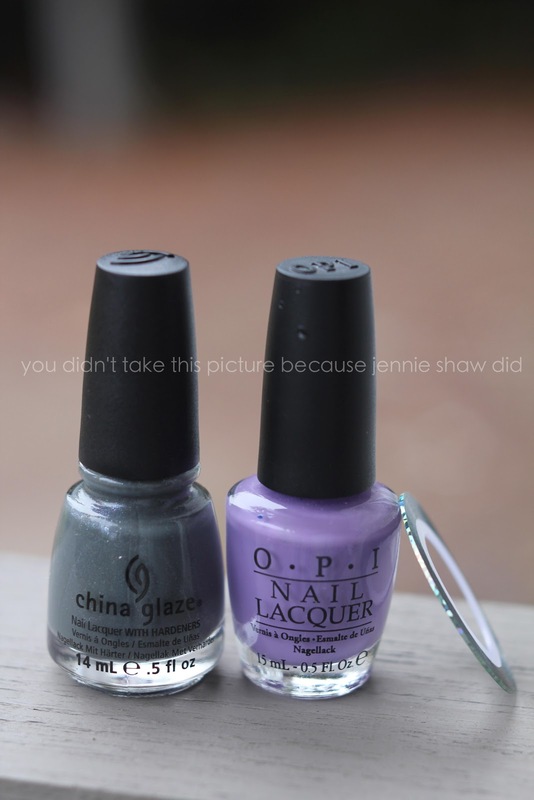 China Glaze Immortal, OPI Don't You Lilac It?, and silver holographic striping tape from eBay. Two coats of everything and then (carefully cut) striping tape with about four layers of topcoat because it really wants to peel off after a day or so. Simple but sassy, if I do say so myself. And it took WAY less time than if I tried to do the stripes by hand. In fact, even with the insane layers of topcoat, this mani still took less than an hour. Yay! And can we talk for a second about how pretty Immortal is? I'm OBSESSED with it at the moment. It's a fantastic grey and the tiny silver, blue and pink sparkles give it a lot of dimension. Well done, China Glaze! Thanks to Tara and Vicki for hosting. Looks fabulous!! Love the gray color! Great match with the holographic tape! Another beautiful job Jennie! Great combo! I need to get some striping tape from ebay now! OMG girl that looks amazing - the colour combo is stellar! LOVE IT!!!! And yes Immortal is a great grey! Hmmmm might have to add that one to the list. So the tapes good? This looks awesome! I love your choice of colors! I love both colors! Very pretty! eep! i love the stripes!!! Immortal is SERIOUSLY gorgeous! I need to get my hands on some China Glaze- can you believe I dont own any?!? !